Fall is finally here! And yes...it did bring some cold weather :) You can bet that I didn't miss the opportunity today to wear some boots and a turtleneck. lol. The weather's not going to last for long like this so I had to capitalize on the moment. I had a great opportunity awhile back to bring my living room into fall in....July for hgtv.com. It was fun. Also a little hard lol. 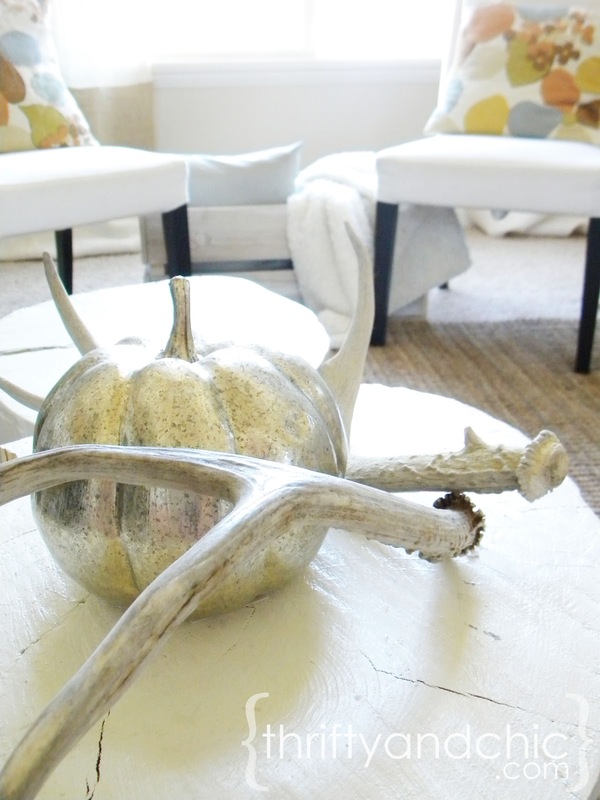 You have no idea how hard it is to find gourds and pumpkins and what not in July :) So, since I obviously didn't keep my Fall decor up since July, you'll probably be seeing another post or two about how its decorated right now. So, as you all know, my living room is rather white. 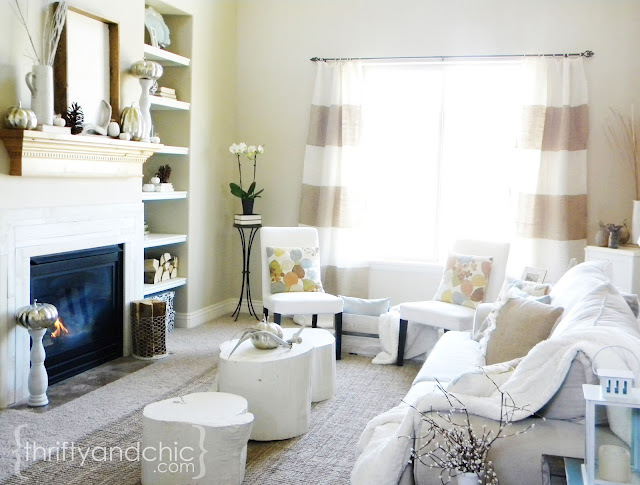 White can be cold and stark (or as I see it, bright and breezy :) ), so to bring in a little warmth for Fall, I used textures but kept the color palette neutral. So, I have to give my husband one thing. Although I don't let him have much control over the whole decorating aspect of our house....When I say 'much', it pretty much means 'none'....I do thank him for his hobbies and letting me use his antler sheds to decorate though :) They too bring in a perfect amount of texture into the room. 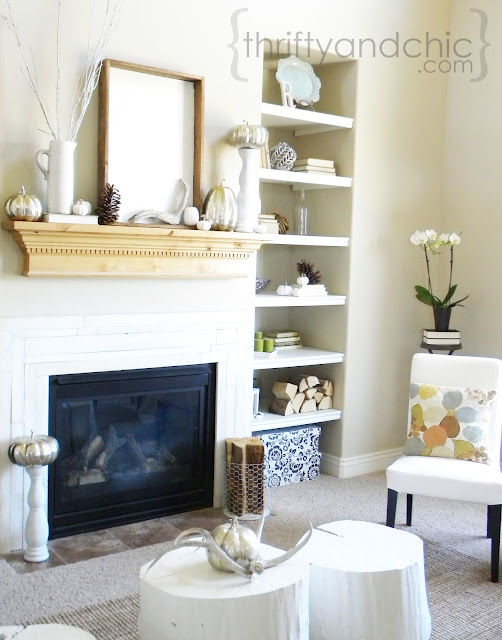 And lets face it, they are white (ish), so it works wonderfully with the decor lol. And I'm sure he feels like I'm making him apart of the whole decorating process :) and that he actually has his hand print on something in our house. If he doesn't feel like that, I don't want to know, cuz that's what makes me sleep at night and not make me feel like a crazy controlling wife ;) lol. 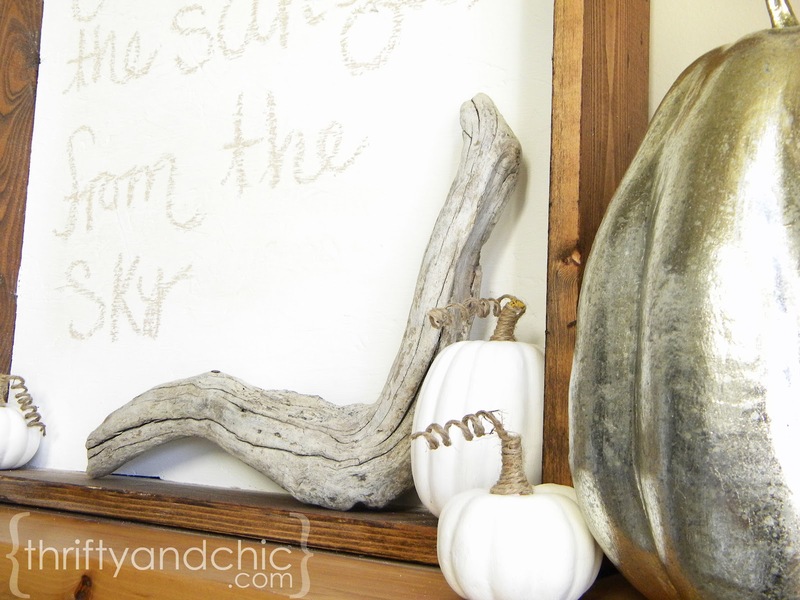 I love the fall colors on the trees and in the mountains ....I don't mind them on my porch either..but for some reason, I'm hesitant to bring them inside :) So, I kept my fall mantel decor completely neutral this year. Aren't these mercury pumpkins great? You can get the same effect by painting either a fake pumpkin or a real one with some glass spray paint. 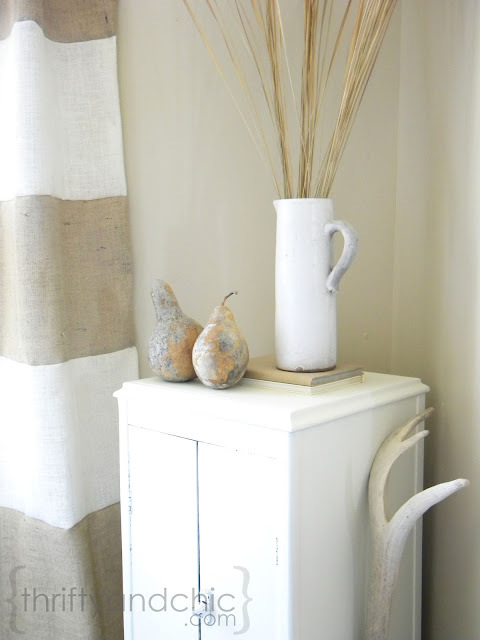 I also decided to bring in some outdoor elements using drift wood, spraypainted tree branches and a humongous pine cone. And on a side note, those orchids in the corner definitely don't look like that any more :( Sad day. Now to wait a few months for them to bloom again . . . And on another note, we turned on the fire for the first time two nights ago. It was wonderful :) I know I'm going to hate myself for wishing summer away when its the dead of winter....but I really do love Fall and its crisp mornings and nights. 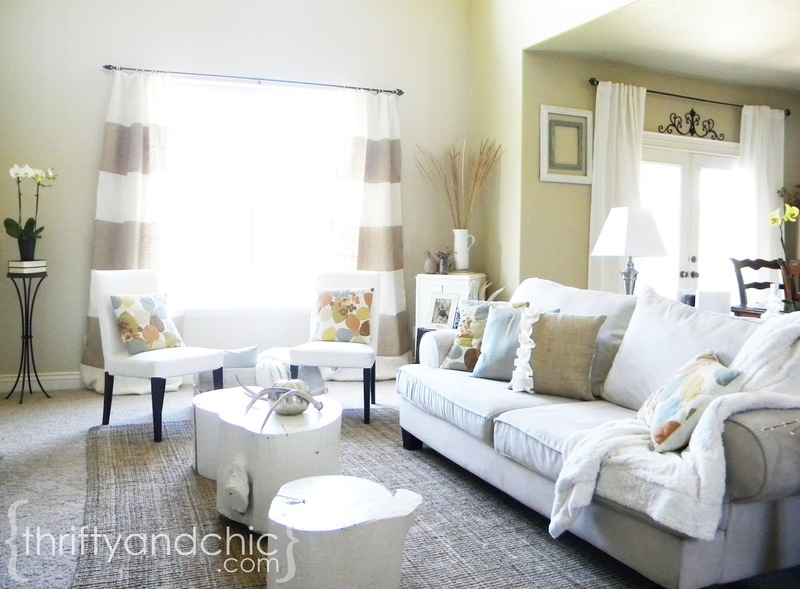 I adore how you decorate and style things. The only thing I wish is that it wasn't all neutral, I'm craving splashes of colour for your home!